As the name indicates, the supercapacitor is a specialized form of the capacitor with an exceedingly high level of capacitance. They are electrochemical capacitors that have an unusually high energy density when compared to common capacitors, typically several orders of magnitude greater than a high-capacity electrolytic capacitor. Their storage capacity is incredible, currently up to 650 Farads. Modules allow even greater storage and higher voltage ratings. These devices which are also known as supercaps or ultracapacitors may have capacitance levels up to several thousand farads and as a result, they are half way between a capacitor and a battery. 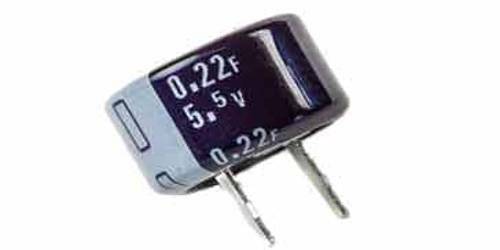 These capacitors may also be known as double-layer capacitors as a result of the way in which they are constructed. 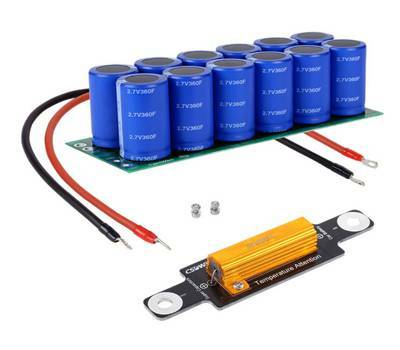 These supercapacitors or ultracapacitors are used in a number of applications. Their very high storage and the high current capability enable them to be ideally suited for a number of instances. They are used in applications requiring many rapid charge/discharge cycles rather than long-term compact energy storage: within cars, buses, trains, cranes, and elevators, where they are used for regenerative braking, short-term energy storage or burst-mode power delivery. Initially, their most widespread use was in memory battery back-up. Here they were able to maintain their charge when a system as running and then deliver the stored charge to maintain the memory in periods when the main power was interrupted. They are also used in UPS, Uninterruptible Power Supply systems. Here they are able to provide high levels of power for a short time. They are typically used in tandem with a complementary power source to supply energy in peak power demand conditions, reducing strain on the primary source and extending its usable life. The high current capability of these supercaps or ultracapacitors has also enabled them to be used in various motor/power applications. They have been used in electric powertrains and also to provide peak load enhancement within hybrid vehicles. Here they can be used in regenerative braking systems, storing the energy reclaimed during braking, and then releasing it to power an electric motor later. The supercapacitor and some battery technologies compete for some applications. It is worth taking a look at the comparison between a typical supercapacitor and a Lithium Ion high capacity battery technology used today. Lithium-ion technology has been taken for the comparison because it is the highest density battery technology in widespread use today. The comparisons made are only for approximate evaluation and any decision should be based on exact figure obtained from manufacturers for devices being considered because technology in both areas is advancing swiftly.